Google Apps is the premier enterprise solution that pushes email, calendaring, communication and collaboration to the web (or the cloud). 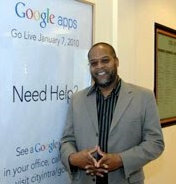 According to WebProNews, the City of Orlando has cut costs by 62% since they’ve switched over to the Google Apps platform. The city of Orlando loves Google, and it’s not hard to understand why – according to the city’s own estimates, switching to Google Apps cut its IT costs by a massive amount. So now Orlando’s CIO, Conrad Cross, is returning the favor (and maybe helping Orlando secure a special prize) by spreading the Google gospel.